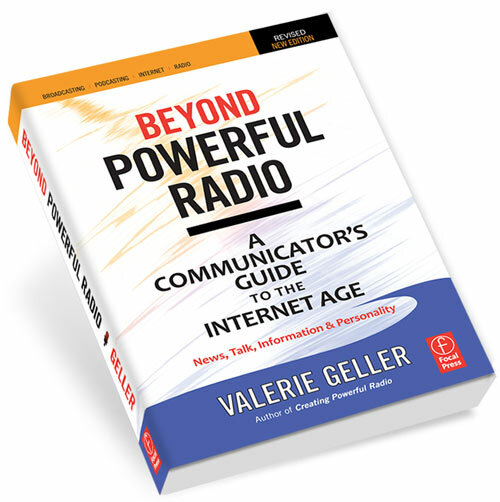 Valerie Geller’s “Beyond Powerful Radio – A Communicator’s Guide to the Internet Age.” The full subtitle is “A Communicators Guide to the Internet Age for News, Talk, Information & Personality, Broadcasting, Podcasting Internet and Radio.” Includes advice from dozens of practicing media professionals! 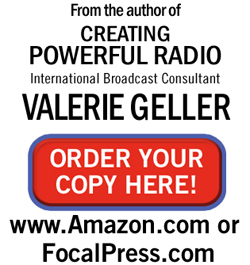 ORDER YOUR COPY OF “Beyond Powerful Radio”, here. How do you create powerful radio via compelling personality? What are listeners really interested in? What are the most common mistakes the talent makes? 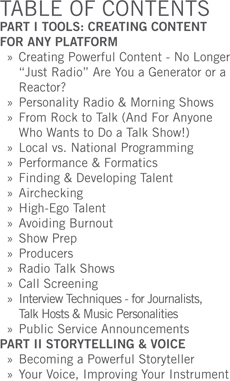 What’s the first thing an on-air talent should do to improve? 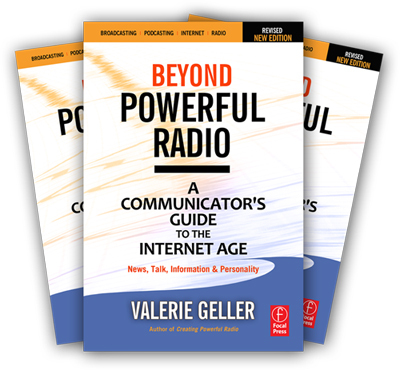 College and Internet Broadcasters - Valerie Geller excerpt from Beyond Powerful Radio on "Never Lose A Listener"
What Do Women Listeners REALLY Want? 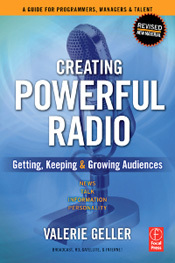 Creating Powerful Radio is availale in a new edition "Beyond Powerful Radio!" 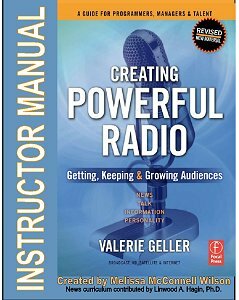 R&R excerpts "Creating Powerful Radio"
Jon Beaupre interviews Valerie on interviewing! The Philippine Star - Valerie Geller Interview "The Play is the Thing"
Where is she now? Find Valerie Geller anywhere in the world! Communicators become more powerful - in 30 Countries! workshops and seminars to help each broadcaster move to the next level. "Creating Powerful Communicators" - What it takes to become great! "Creating Powerful Content" - Proven techniques to engage an audience! 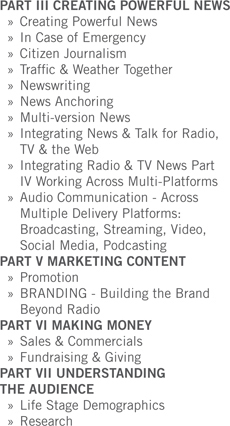 ""Creating Powerful Radio News Workshops" And more! Upcoming event: Creating Powerful Communicators! T-Shirt slogan: "If you want me to listen to you, then you have to listen to me." Are you using social media? Are you fully taking advantage of all the ways to engage your audience? By successfully implementing social media, you add a powerful "extra canvas" to engage more powerfully with your listeners and grow your audience! Social media expert and international broadcast consultant Valerie Geller shares low-cost, high-return social media tips expressly for small market radio, which, when done effectively, will result in greater audience engagement, ratings growth and advertiser response. Introduced by: nationally syndicated host Doug Stephan - host, "Doug Stephen's Good Day"
RE: Content: Expanding on material from "Beyond Powerful Radio - A Communicator's Guide to the Internet Age" (Focal Press 2011 www.beyondpowerfulradio.com ) - There are NO boring stories - only boring storytellers - These Powerful Radio techniques can help any station anywhere develop stronger content and learn to more powerfully engage with listeners. "Not enough time, not enough people and not enough money" are NOT excuses. Small and medium market stations are in a unique position to super serve their local communities using social media. This session will focus on how to understand and better use social media, (and it doesn't cost!) to help cover your community, build loyalty, build clients and build audiences. INCREASE YOUR RATINGS BY TARGETING YOUR AUDIENCE MORE EFFECTIVELY! NEVER LOSE A LISTENER! GROW YOUR AUDIENCE! Do you know about Geller Media's LIFESTAGE DEMOGRAPHICS™? 1. Speak visually, in terms your listener can "picture." 2. Start with, your best material. 7. Address an individual, use "You,"
- talk to ONE listener at a time! 8. Do engaging transitions & handoffs. 9. Promote, brag about your stuff. 11. Be who you are. 12. Take risks. Dare to be great. "Thanks for coming and speaking to our group. and love for the job!" 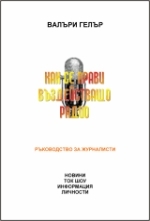 Attention Managers, On-Air Talent, Podcasters and Programmers ---- Get Results! "Time to read and re-read another [Geller Powerful Radio] book. I love what [Valerie] has to say." "I've just been nominated for Speech Broadcaster of the Year for (UK) the Sony Radio Awards - up against best of the nationals... It's the Beyond Powerful Radio methods that got me here. Thank you." Full Instructor Manual is Available! Email Valerie for Instructor Manual Information. to all of our PD's across the Country! Another great book, Val...thank-you!" Internationally acclaimed broadcast consultant and talent coach, Geller works with top stations, individuals, and broadcast groups throughout the world, focusing on news, talk, information, and personality programming. 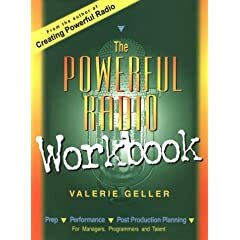 Geller's Powerful Radio books have taught these winning techniques to broadcasters and communicators in sixty countries and have been translated into several languages. 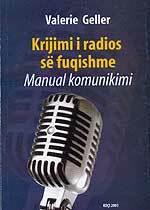 Many broadcast professionals throughout the world regard Creating Powerful Radio as their "bible." 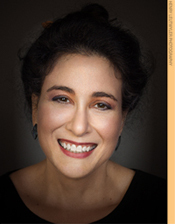 Beyond Powerful Radio is Geller's fourth book. Learn more about consultancy opportunities for your station at www.gellermedia.com. This page, and all contents, are Copyright (C) 1996-2007 by Geller Media International, New York, New York, USA.